Nick’s own experiences in life have contributed to a series of thoughtful programmes about sensitive and complex issues, often in uncharted waters, which have already aired. “I have previously made a number of films from the perspective of children where I have given cameras to children to record their stories, thoughts and feelings as they waited to be adopted or fostered and also a feature length documentary looking at the issues of being raised by a single father when mum has gone.” Other acclaimed and award wining productions include God’s Cadets (BBC4 Jan 2014), Golden Oldies (BBC1 Oct 2012), The Protectors (BBC1 2005). 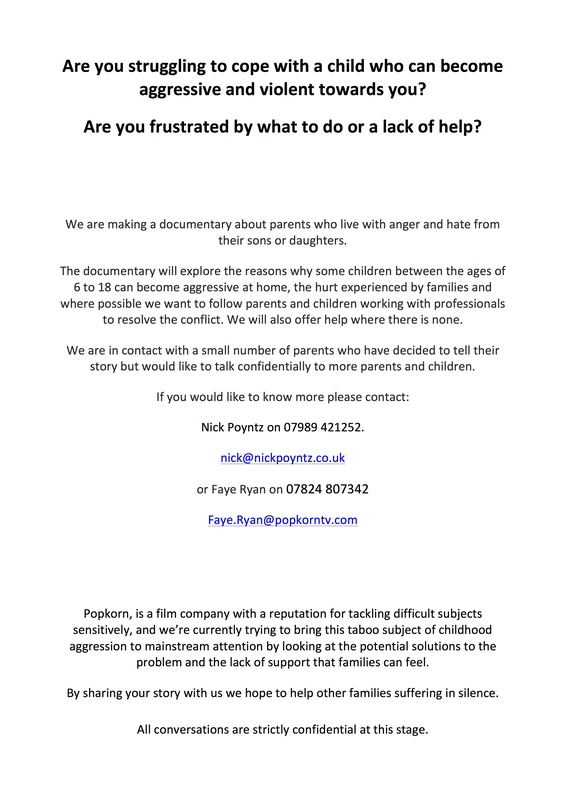 Nick has begun the process of meeting with practitioners and families through his own investigations and contacts and has now asked me to bring his project to wider attention in the hope of attracting further interest. If you would like to explore this further with him then please do contact him on the details listed below.